Arizona’s climate is much more diverse than the sandy deserts it brings to mind, but it is still an overall dry place that brings weather hazards along with it. 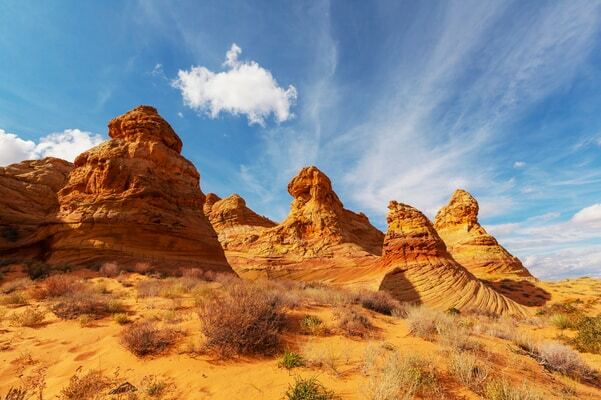 The north is pine-covered and home to the Colorado Plateau and has cold winters and cool summers. The Central Highlands transition zone has mountain ranges and forests that experience mild winters and the south is known for its warm winters and hot, dry summers. Exposure to extreme heat for longer periods of time is a concern and can become deadly if certain precautions are not followed. Dry areas are susceptible to wildfires and Arizona is no different. A sound evacuation plan in wildfire prone areas is advised. Arizona has two rainy seasons. The winter rainy season is usually accompanied by cold fronts and the summer rainy season can bring heavy downpours. The hot moisture during this time of year brings lightning, wind, thunderstorms and torrential downpours. Though the heavy downpours are typically brief, they often cause flash floods, which are extremely dangerous. Lightning storms are also common and must be prepared for. Intense thunderstorms can also cause dust storms that cause little to no visibility and unsafe conditions.